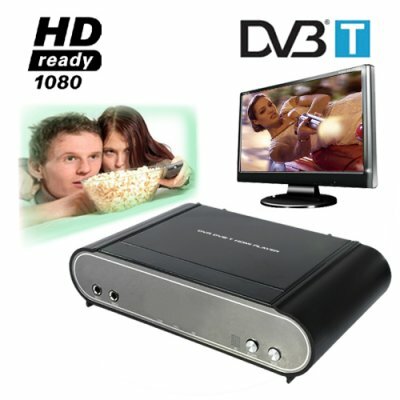 Successfully Added HDD Multimedia Player + DVR with DVB-T (Hi-Def up to 1080i) to your Shopping Cart. The CVHQ-E19 has already been called "World's Best HDD Media Player and DVR" by some people because it comes with such a dazzling feature set offering you an unbeatable combination of power, versatility and functionality for the modern digital age. This is a High Definition SATA hard disk drive (HDD) enclosure that provides you with the functionality of a multimedia file player, Digital Video Recorder with OTR and Time Shift functions, DVB-T receiver for Digital TV reception and high capacity HDD for file storage. Fully HD Ready out of the box, with native support for 1080i High-Definition output, the CVHQ-E19 immerses you in an exciting world of modern digital entertainment. Capable of using SATA hard drives (2.5 or 3.5 inch) up to a massive 1.5TB HDD, this HD DVR Player has built-in media recording and playback to give you all the space you will ever need to enjoy your favorite digital multimedia. Watch, listen, create and enjoy. With full support for a range of video, audio and image formats, the power of this multi-functional HDD system gives you the freedom to enjoy the multimedia that you want, when you want, opening up a world of digital possibilities. A responsive remote controlled user interface places you in full control of the powerful built-in features. An additional bonus feature for those of you living in the EU, the onboard DVB-T tuner allows you to enjoy high quality digital TV on your existing TV set. This unit make a great alternative to a limited feature set top box, since this unit also works like TiVo, coming with a powerful Timeshift feature with fully customizable recording schedules to ensure that you never miss a minute of your favorite show again. The CVHQ-E19 is perfect for enjoying your favorite digital media with your family, entertaining friends and visitors and also for special occasions like parties. This would also make an ideal gift for anybody who enjoys high definition entertainment, has a large collection of digital multimedia, or has a busy lifestyle and would appreciate a great alternative to TiVo. Note: This product is not sold with a Hard Disk included. You will need to purchase a hard disk separately. The disk must be formatted in FAT32 if you want to connect the unit to a TV for file management. The HDD can also include an NTFS partition for simple external disk storage (via USB), however when using this unit as a stand-alone media unit we recommend formatting your entire disk in FAT32. No need for blank DVD`S to record T.V. programs, I am very satisfied. Everything works well but fan is very noisy. Could use a US F type for TV antenna. OTTIMO HARD DISK MULTIMEDIALE!!! CONSEGNA IN 3 GIORNI!!! OTTIMO TUNER DVB-T E QUALITA' DI REGISTRAZIONE DVB-T DI ALTISSIMA QUALITA'!!!! GRANDE CHINAVASION!!!!!!!!!!! !